Pink tulips blossom to their fullest near the entrance to the Alberta Temple in Alberta, Canada where a beautiful garden filled with many colors is the perfect blend with the white architecture of the temple. Each pink tulip stands tall and colorful amongst the greenery of the rest of the garden outside the temple. 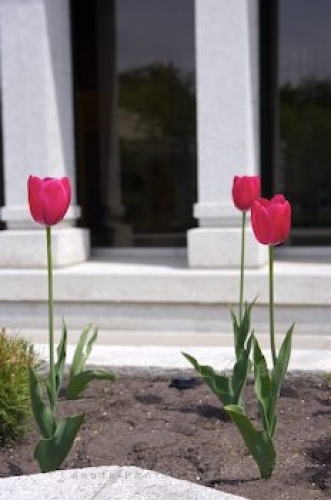 class="description">Pink Tulips, Tulipa, growing in the gardens at the entrance to the Alberta Temple, Church of Jesus Christ Latter Day Saints, in Cardston, Southern Alberta, Alberta, Canada. Picture of pink tulips in full blossom in the gardens at the Alberta Temple in Alberta, Canada.